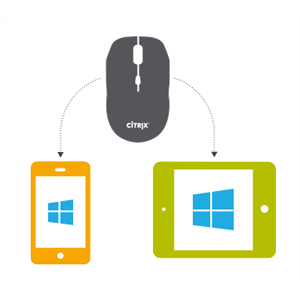 Designed to optimize industry-leading XenApp and XenDesktop solutions, Citrix X1 Mouse empowers enterprises to truly mobilize the workforce by enabling the complete Windows app and desktop workspace experience on mobile Apple devices—transforming them into powerful business productivity tools. Citrix X1 Mouse revolutionizes the Windows app and desktop experience on Apple iPad and iPhone devices by providing the complete mobile workspace experience for the modern on-the-go workforce with the click of a mouse. Citrix delivers the only app and desktop virtualization solution to provide a Windows mouse experience on Apple mobile devices, as well as Android and Windows, for the best possible user experience for any device.